The little rodent that stars in the fantastic puzzle HTML5 adventure Hamster Go Home has escaped from the pet shop and got lost. Now he needs you help because he wants to find a new home so badly and can't do it on it's own.On the way through 60 fun packed levels he has to solve puzzles and to make use of tools like bombs and a teleporter to clear the way and to collect three stars that are spread across each level. The game features realistic physics and hilarious achievements that make it even more fun. 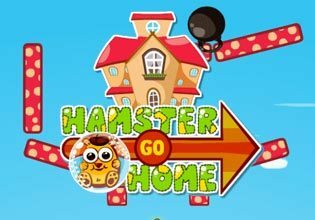 Play Hamster Go Home now for free and help the poor little fellow to get home safely!